On March 10, 1955 the rate payers of School Section #5 voted to have trustees Robert Coskey, Ross Adams and Carl Sherk to build a new school. The 3.78 acre site on the north side of Omer Avenue was purchased for the sum of only $5000.00. What a deal! Construction began on July 1, 1955 and students were in their classrooms at Oakwood by October 31, 1955. The enrollment of the new Oakwood School on that date was 207 pupils. The first principal was Mr. Charles Briggs, B.A., Paed. The 'official' opening of Oakwood was held on December 18, 1955 with a ribbon cutting ceremony performed by Mr. Jacob Barrick, one of the oldest former pupils of School Section #5. The original building had four classrooms and a gymnasium being added in 1958. In 1961, two more classrooms were added to the site. A final addition in 1972 was a library resource centre. 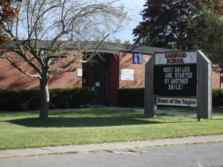 In September 2002, Oakwood School became new home of the Special Needs Program in Port Colborne. We have two special needs teachers and several educational assistants who are well-trained, experienced and caring. The school has newly renovated classrooms which include therapy, multi-sensory, and health care rooms. Additionally the special needs, wheelchair accessible children's playground, has been rebuilt here. The school has been upgraded with ramps, wider doorways, an automated entrance and a new washroom to accommodate students with special needs. Many of the students are integrated and supported in regular classrooms. However, we strive to effectively meet the challenging intellectual, physical and emotional needs of all the children in the program. Staff' at Oakwood have an inherent commitment to directing our students to strive for academic excellence. They are also truly dedicated to providing opportunities for personal growth and for the development of an intrinsic appreciation of our country's ethics. Through collaborative problem solving and shared experiences (as are found in cross-graded theme days, Snuggle Up and Read and extra- curricular activities), students develop the ability to work together as a team. We are proud and appreciative of our community volunteers, our School Advisory Council, our Home and School Committee, our teachers, and our students. We are a community of life-long learners working together toward a common goal.